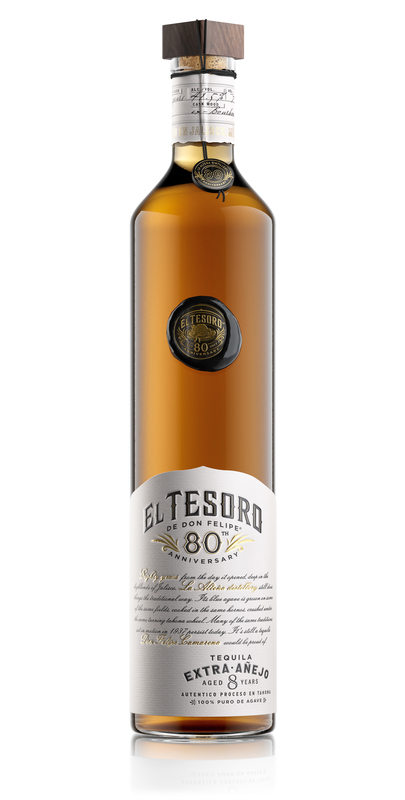 In celebration of a landmark anniversary, El Tesoro of the legendary La Alteña distillery has announced the release of a special sipping tequila with agave-forward flavor and oaky, woody notes: El Tesoro™ 80th Anniversary Limited Edition. Only eight casks of this carefully crafted spirit have been produced for distribution. Bottles hit shelves beginning October 2017 with a retail price of $200, and tequila fans should take note that this limited edition will be available for purchase exclusively in the U.S. market. Founded in 1937 by iconic tequilero Don Felipe Camarena, El Tesoro makes all of its tequilas using time-honored techniques. The same painstakingly careful procedures were implemented in creating this high-quality, limited edition tequila before it was casked for eight years to age to perfection in American oak ex-bourbon barrels . As such, this batch is one of the most aged expressions that El Tesoro has ever released. El Tesoro’s tequila production process begins with 100% estate-grown blue agave which grows for up to eight years in La Alteña’s mineral-rich soils and highlands climate, giving them a spiciness that is not often found in Jalisco. When the agave reaches peak maturity, it is harvested by hand, removing the waxy stem for a smoother flavor. Sometimes, it can take the company’s jimadores up to three years to completely harvest a field. After harvest, the hearts of the blue agave – called piñas – are cooked in an old-fashioned hornos oven for three straight days. They are then slowly crushed to release all their juice under a massive, two-ton volcanic tahona wheel. For this 80th Anniversary Edition, the liquid extracted is then distilled to 85 proof* at a low temperature in copper stills that were made to Don Felipe’s specifications. El Tesoro is believed to be the only tequila to distill to proof, with no sugar or water added. The tequila is a pale yellow with an aroma of green olive, wood and smoked notes with a hint of white peppercorn. It has a taste of Agave with light peppercorn and floral notes, balanced with oak, caramelized wood, smoke. The finish is one of lingering green olive, wood and light smoke.